Hello everyone... Helen is here with an idea for Valentine's Day Treat Holder. 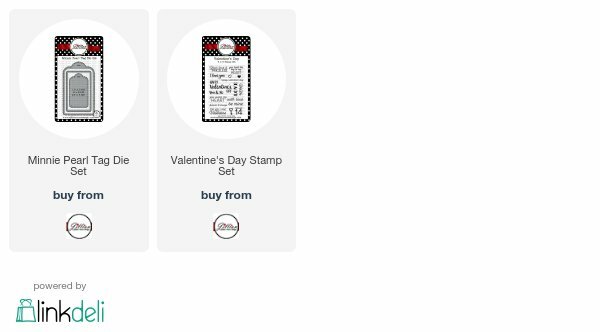 I created this treat holder using the Minnie Pearl Tag Die Set and Valentine's Day Stamp Set. First I cut out the tags out of 2 shades of pink cardstock. Next, I stamped the rectangle die cut with some hearts from the stamp set with Angel Pink Memento Dew Drop ink pad. 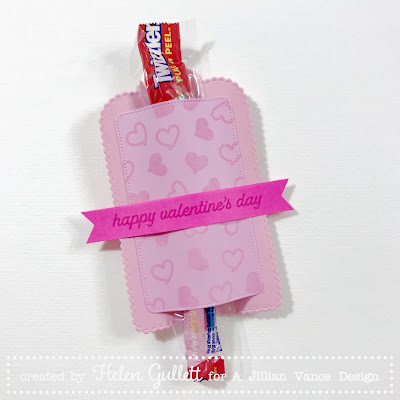 And then I put the rectangle base on the tag using 1/4" double sided tape at the on only the 2 sides of the rectangle die cut, that leave the top and bottom open to slide in the candy. After that, I stamped the sentiment on the hot pink cardstock with Rose Bud Memento Dew Drop Ink pad, then I cut the sentiment strip into banner, and added it on the holder with double sided tape also. The Valentine's Day candy treat holder is done :) I hope this give you an inspiration to create today! What a fun little treat holder Helen!